- along with a shot history time plot and more! With advancements in bluetooth connectivity, the aged and cumbersome approach to customizing marker settings needed to be improved upon. A better user interface needed to be made, and NifteeCircuits sought to make that difference! Along with being first to market Bluetooth connectivity to paintball markers at an affordable price, the NifteeTrigger also has the ability to be updated with firmware upgrades as they become available, ensuring the best operation of your paintball marker today, tomorrow, and in the future. 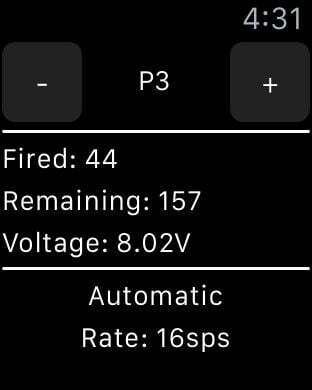 What's more - the NifteeTrigger has an accompanying Apple Watch app that conveys detailed information such as shooting profile, trigger mode, and low-hopper haptic feedback[watch vibrates when hopper is low]. These are just a few of the features present in the NifteeTrigger with many more to come in future firmware updates/release!